My friend April, also known as The Tipsy Housewife, is always talking about "fridge forage" meals. You know what I mean, it's when you need to go to the store, but don't have time, so you start digging through the fridge and pantry to see what you can come up with. LOL I find myself doing this a lot, and to be honest, some of my best recipes have come from of it. What is it Plato is quoted as saying? "Necessity is the mother of invention." Anyway, today's Baked Crispy Pesto Chicken Recipe is the PERFECT example of a "fridge forage" meal. To begin you will need to preheat your oven to 425 degrees. Next you will need to place your chicken into a greased baking dish. Now in a separate mixing bowl combine the pesto with 1/4c of the cheese. Spread the pesto and cheese mixture over your chicken breasts. I love using pesto in recipes because each little jar is PACKED full of flavor! Garlic, cheese, herbs, oil, seasonings, everything you need in one big punch! Sprinkle the remaining cheese over the chicken. Now add the panko bread crumbs. To help the bread crumbs brown in the oven, I like to spritz them with a little cooking spray. This next step is totally optional, but I also added a little chili flake for heat. You have a Winner, Winner, Chicken Dinner! 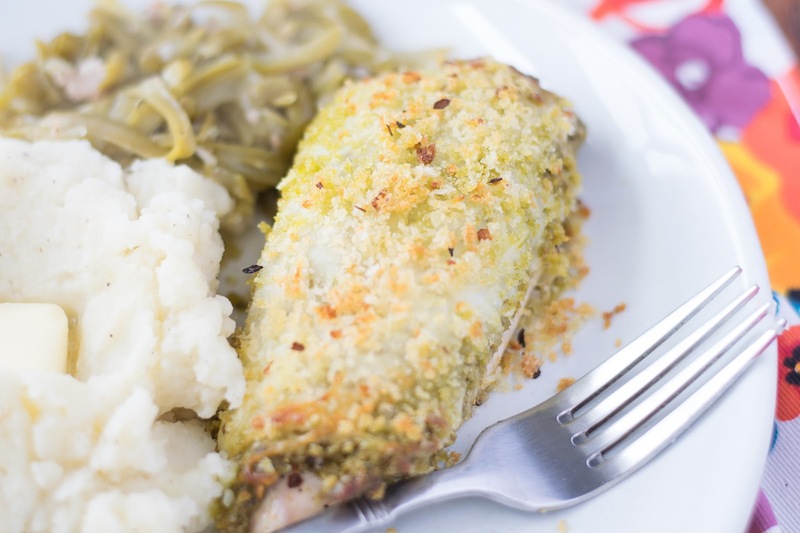 I served this Baked Crispy Pesto Chicken Recipe with some mashed potatoes and green beans, but a nice salad and roasted broccoli would be great too! I should let you know that my husband, who is not the biggest fan of pesto, went in for seconds because it's that good! 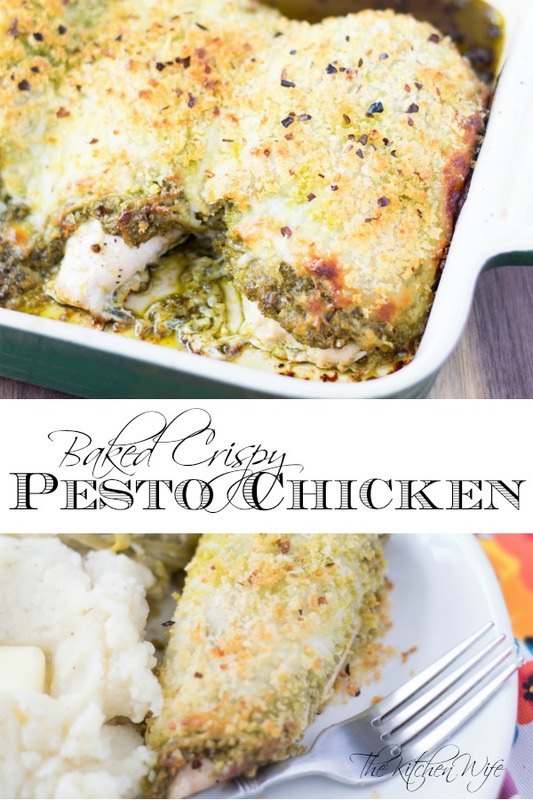 So head on into your pantry, dig out the goods, and get creative tonight with this Baked Crispy Pesto Chicken Recipe. Also, I would love to hear what some of your favorite "fridge forage" meals are, so leave them in the comments below. Add the chicken to a greased baking dish and season with salt and pepper. In a separate mixing bowl combine the pesto and 1/4 c of the mozzarella cheese. 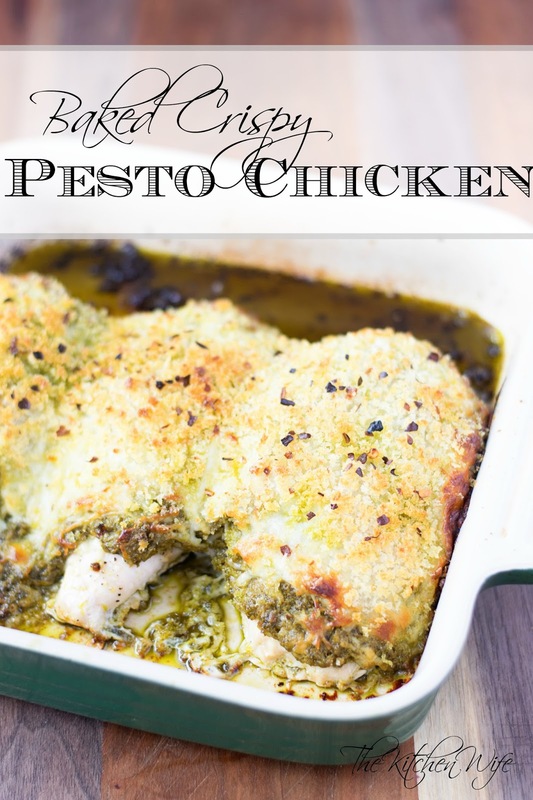 Spread the pesto and cheese mixture over the chicken. Sprinkle the rest of the cheese over the chicken. Sprinkle the panko bread crumbs over the chicken. Spritz the bread crumbs with a little cooking spray to help brown in the oven. Place into the preheated oven and bake for 30 minutes.